The Economic and Financial Crimes Commission, EFCC, Kaduna Zonal Office has intercepted an undeclared sum of N49 million at the Kaduna International Airport. Ibrahim Bappa, the Kaduna zonal head of the EFCC, while addressing journalists on Tuesday in Kaduna, said the money was stashed in five large 150 kilogramme coloured sacks ,following an intelligence report received by the zone. He said during a routine baggage screening of supposed check-in baggage, the five bags were sighted unattended to and without tags, “containing fresh bulk items suspected to be money from the aroma perceived from the sack. “The owner of the money later showed up but couldn’t state the exact money in the sack or present any document authenticating the genesis of the money. “However, his inability to give any concrete explanation made him become uncomfortable and he disappeared into thin air before the arrival of EFCC operatives,” the zonal head said. Mr. Bappa said the operatives later found out that the suspect had fled the airport vicinity leaving the sacks behind. 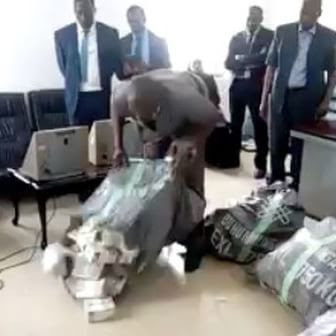 He said upon scrutiny of the contents of the sack, it was discovered that they contained fresh crispy naira notes of N200 denomination in 200 bundles totalling N40 million and N50 denomination in 180 bundles totalling N9 million.